Having not had to use this extra vacation day in travel mishaps, I could sleep in a little, but eventually I turned toward working on house projects that needed doing. 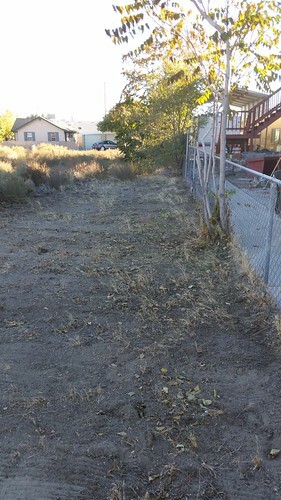 I got out the tools and started clearing tumbleweeds and brush from this portion of the adjoining lot. This is not our land (although we'd like to buy it if we could afford it and it was offered for sale), and much of it looks like the section in the distance. I cleared enough space here so that when we get a trailer of firewood (soon; it's running below freezing here and the space heaters aren't enough) it will be easier to unload it directly over the fence rather than having to shuttle it to the wood box with a wheelbarrow. 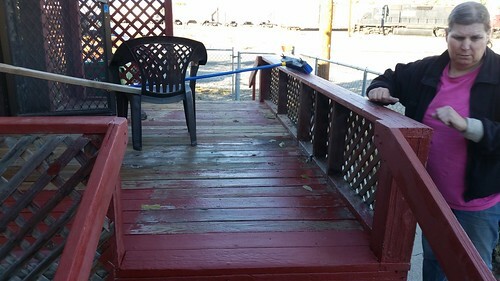 After wielding the electric blower to clear leaves and dust, Lisa applied more sanding sealer as primer on a new section of the front porch. I called the local auto-body shop about the windshield. In retrospect, I should have called them on Friday morning to get into their queue. They are so busy that they couldn't even call me back to tell me when they can actually get around to fixing it. I told them that if it was going to take weeks or something like that I can go somewhere else, but I was trying to spend my money in Fernley if I could do so.